It should be incredibly special, meaningful and memorable. Your wedding day is one of the most important days of your life. It should be incredibly special, meaningful and memorable. Every couple’s relationship is unique and your wedding ceremony should reflect your relationship in all its aspects. 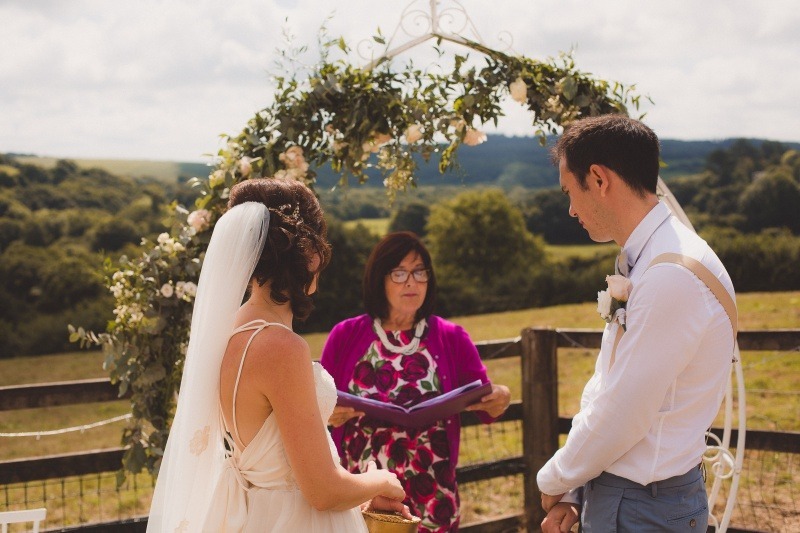 Choosing an independent celebrant to host your ceremony ensures you have a wedding ceremony that is as individual as you are; a ceremony that reflects your personalities, and is perfectly tuned to the love you share. Without the constraints of church or registry office, you have the freedom to choose a venue for your wedding ceremony that is special to you. It might be beautiful location that you love to visit, a windswept beach, a beautiful meadow, or even a quiet family gathering in your own home and garden. Using a wedding celebrant means that you are not bound by tradition and you are free to let your imagination inspire you. Your Order of Service can be as secular or as spiritual as you wish. I really enjoy the experience of working together with a couple and seeing their Wedding Ceremony evolve. Poems and readings are suggested, music is chosen, vows are written and gradually their dreams take shape. The joy and excitement you feel on starting married life together is captured and shared with all your family and friends. I am happy to include any special elements or family traditions. My prices page gives you a brief insight into some of these elements. My family is very important to me, so let me introduce them to you ! 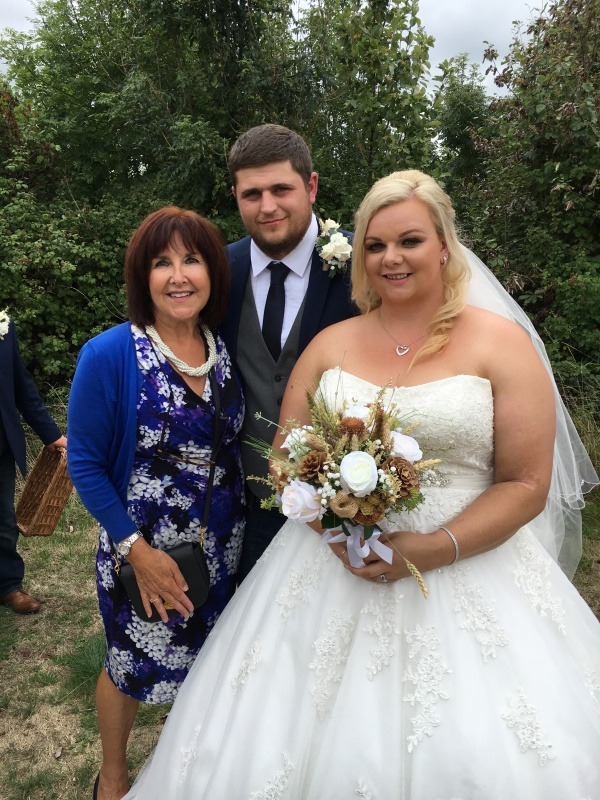 This is my wonderful son, Stewart and his beautiful bride, Lorna. They have made me a proud grandmother twice over ! Stewart and Lorna chose to have a very traditional wedding. 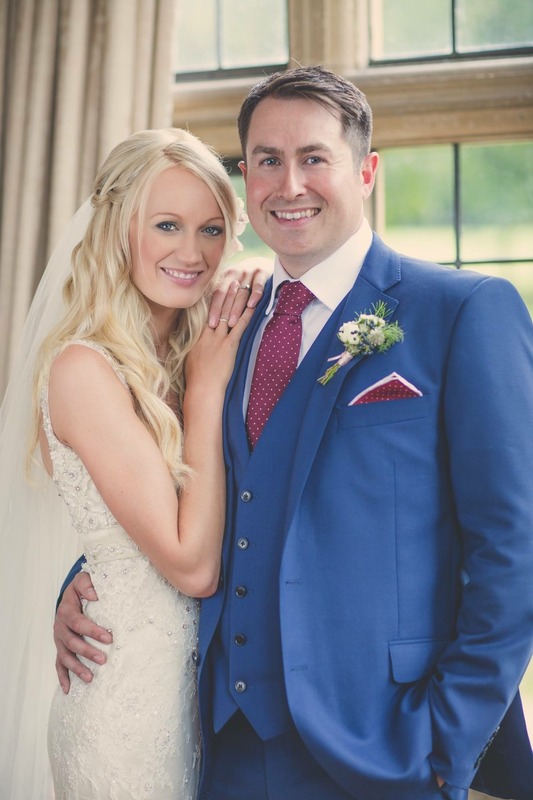 They married in the beautiful Butleigh Church, followed by wonderful reception at Coombe Lodge, Blagdon. I’m very pleased to say that I am leading a wedding ceremony there, this summer. 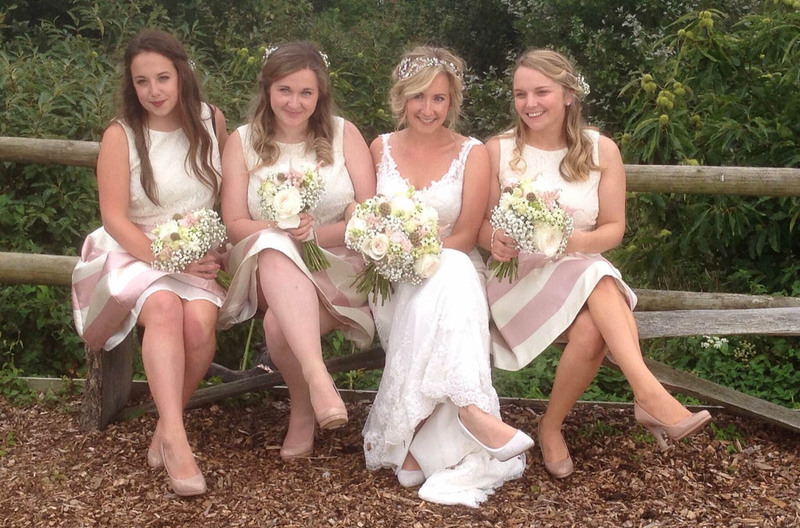 My eldest daughter, Sophie, on the other hand, chose a very different style of wedding. We had a weekend, wedfest Tipi wedding overlooking Chew Valley Lake. I was lucky enough to lead a wedding for a lovely couple there myself last year. So, two very different weddings, not just in style but in every way. However, they were both wonderful, unique and truly joyous accasions. Oh, and Sophie has made me a happy grandmother too ! Tess and Dave had a beautiful country wedding in the amazing garden and paddock of her parent’s home in the Quantocks. The garden was stunning. The result of a whole year of hard work to make it picture perfect. Jugs and jars of garden flowers, sunflowers growing up a home-made rustic arch and Tess arriving on her dad’s rusty old tractor, certainly made their wedding ceremony a personal, unique and memorable occasion. 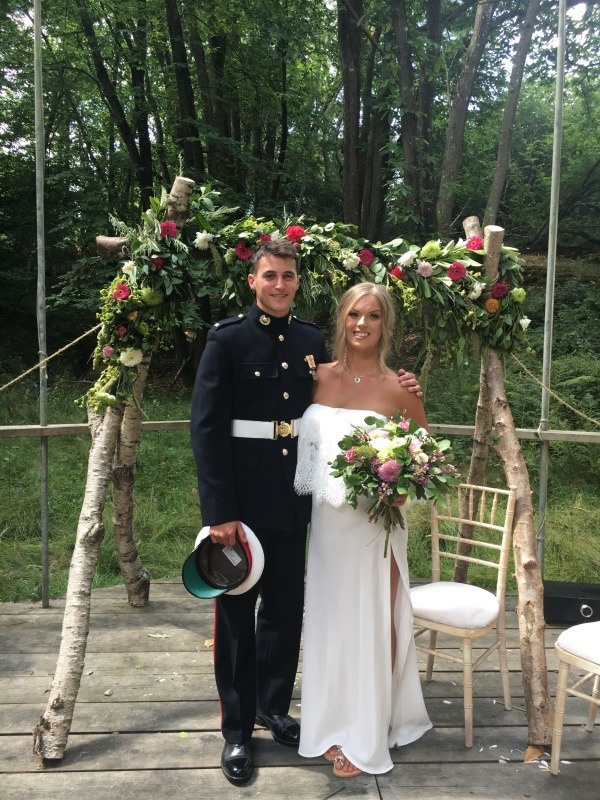 Sacha and Ross shared their wedding date with Meghan and Harry. 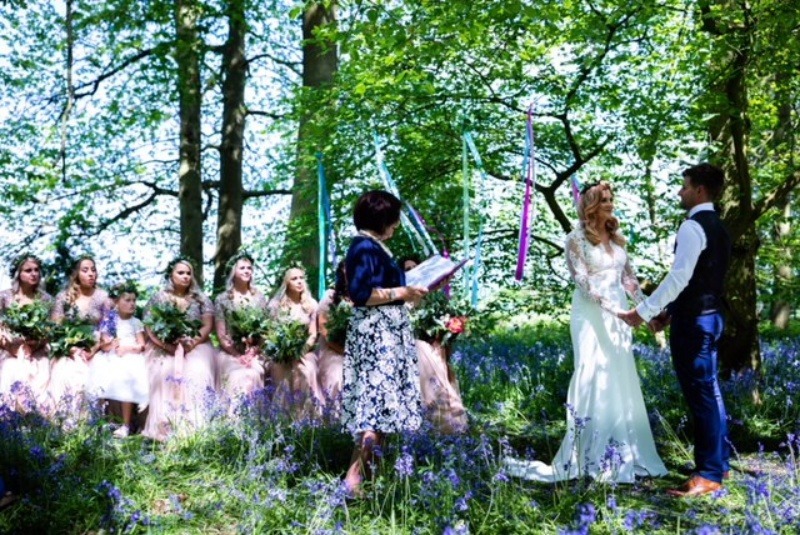 They chose the most perfect day for their Wildwood bluebell wedding. The ground was a carpet of blue. The summer sun dappling through the trees created the most magical effect. Can you see how the beautiful bridesmaids are sitting facing the guests? The same number of groomsmen were on the other side. This seating arrangement is stunningly effective. It creates a natural enclosure for the ceremony space, the guests are treated to a wonderful scene and of course, the photos are AMAZING ! 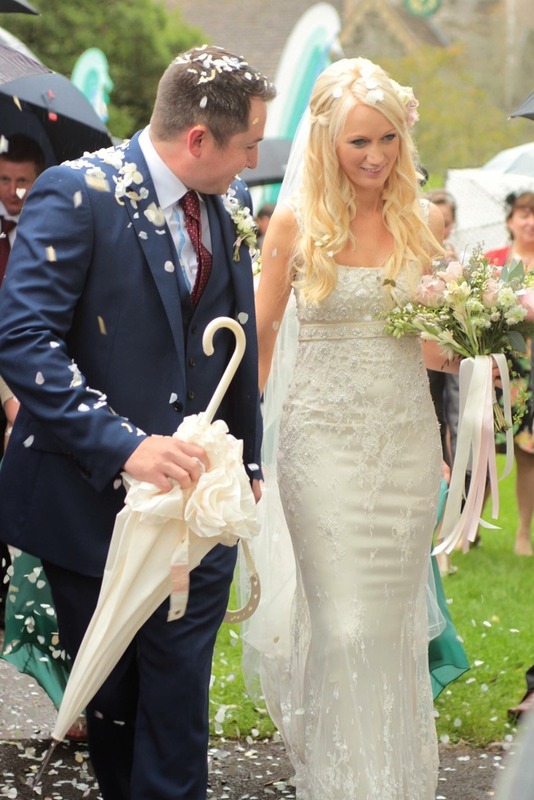 Matt and Katie had a wonderful, weekend, wedfest wedding in Partyfield in Dorset. Many couples choose their readings for their readers. Other couples let their readers choose the readings themselves. Katie’s sister kept her reading as a surprise for the ceremony. It was a beautiful tribute. I print all readings onto parchment paper and tie them with satin ribbons to match the wedding colours. Jennie and Greg are a great couple who moved to Australia, but came back home for their wedding ceremony. It was held at Woodford Farm, near Wells. All the planning was done long distance and we didn’t meet until the day before, which was very exciting! 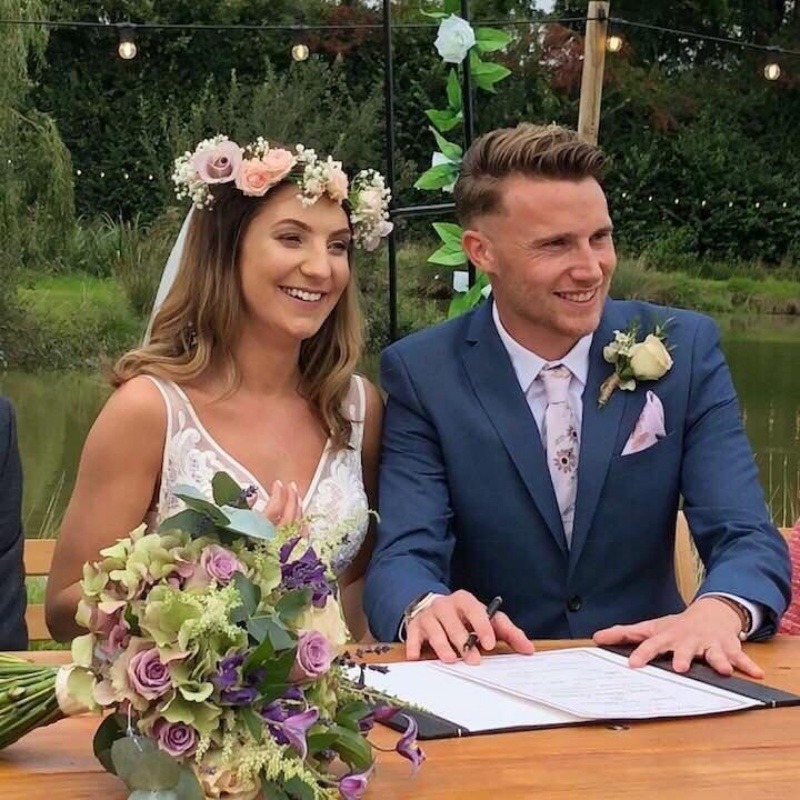 Jennie and Greg included a bespoke parchment signing in their wedding ceremony. Check out the amazing skills of their florist, Luce Loves Flowers. Louise and Ian had an amazing, family centered wedding, with their two boys and little dog, playing major parts too. Their venue was stunning, a converted engine house in Trelion, Cornwall. It had amazing views across the Fal Valley, which made a beautiful backdrop for their ceremony. Many of their friends had young children. It was lovely to see them well catered for, with child minders, play tents and entertainment, leaving the adults free to have their own fun ! Tanya and Tom had a wed-fest wedding with a country and western vibe. Lots of hay bales, jeans, cowboy boots and an amazing ceremony space, overlooking Chew Valley Lake. A shaky moment in their wedding ceremony was during the exchange of rings. Their best man, known for being a joker, had swopped the rings in their boxes with jubilee clips, and, for an instant, as the boxes were opened, we just looked on in stunned silence ! 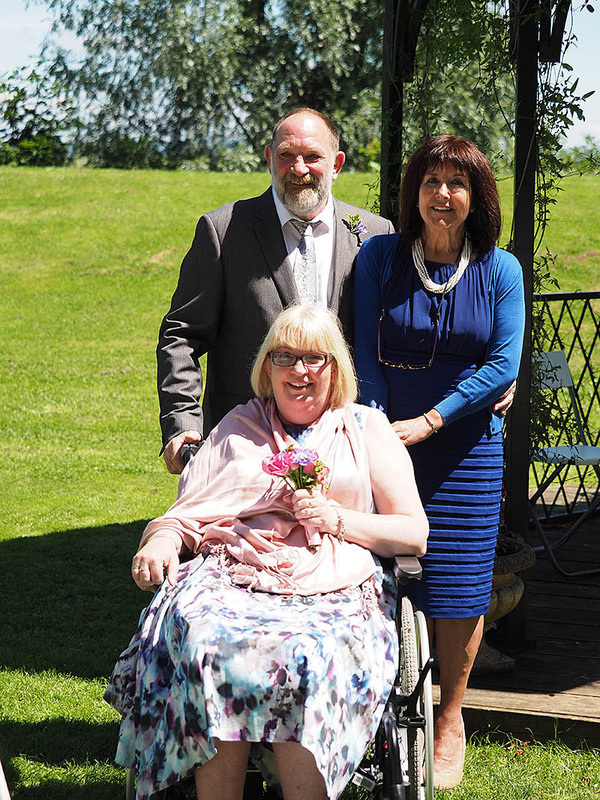 Ellie and Chris had their outdoor wedding on a scorcher of a day. I just love the sheer joy captured on Chris’s face as he sees his bride walking towards him. 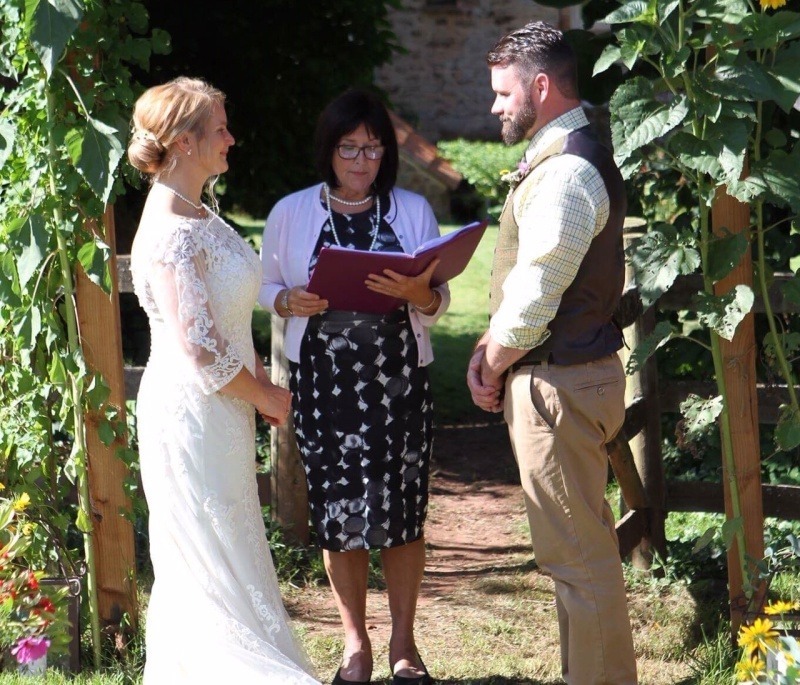 Ellie and Chris chose to include a wedding parchment signing in their ceremony. The day just got hotter and hotter, so we decided to move the signing to just after the ceremony and held it inside the barn, accompanied with Champagne and Canapes. It was delightful ! Deirdre and Roger had a Renewal of Vows Ceremony, to celebrate 25 years of marriage ! 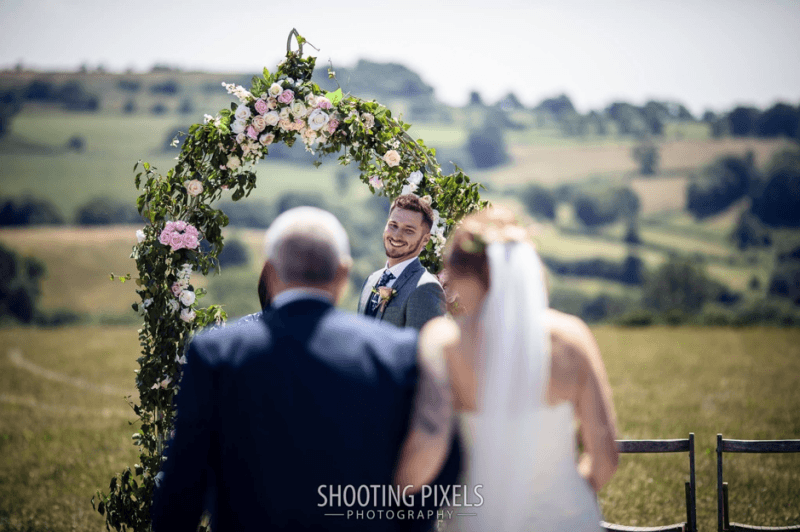 They both very much felt that their first wedding ceremony didn’t really reflect them as a couple and so wanted a more intimate and personal ceremony the second time around. It was a wonderful opportunity to include their two grown up children and to thank their close family and friends for their love and support over the years. Roger got a wedding ring this time around and treated Deirdre to a new one too! 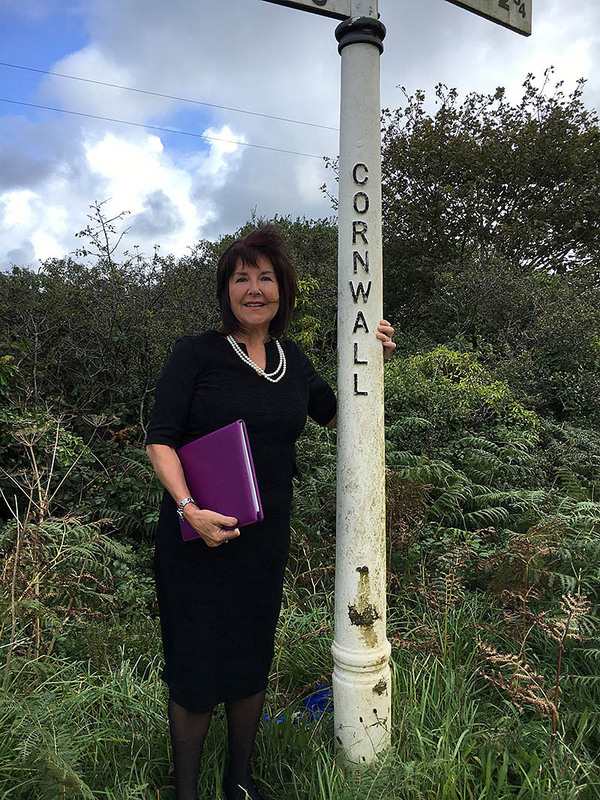 This is me on the way to a wedding ceremony in Cornwall. I saw the sign and made Brian park up and take a quick pic. I’m lucky that as we have a small place in Padstow it means I am able to cover the whole of the Southwest and beyond. And the good news for my couples is that mileage costs for Cornish and Devon weddings are therefore kept low. For more information or to discuss you own personal needs, please email me or complete the online Contact form. Thank you so much for helping make our ceremony perfect for us – it was exactly as we wanted! Thank you for such an amazing day, it was a real pleasure to have you marry us. Thank you sooo much for all your hard work you put into our ceremony! It was perfect! Everyone has said to me it’s the most amazing ceremony they’ve ever seen! Thanks to you! T and J’s wedding was so beautiful, your service was so personal and meaningful. Just amazing, I’m blown away, thank you Carol, you have really captured who we are as a couple.! You spent time and effort to get to know us and produce a ceremony that fitted us perfectly. Thank you for your patience, help and support. We had such an amazing time, and wish we could do it all again! Thank you especially for such a wonderful ceremony. Everyone who witnessed commented on what an amazing ceremony we had, even with me forgetting the rings (people thought it had been scripted haha). We would love to meet up again and collect the copy of our ceremony. We can show you the photos that have just come back from our photographer too. Thank you so, so much for everything you did for our wedding! You really were so calming and went above and beyond, which ultimately made everything feel so much more special.